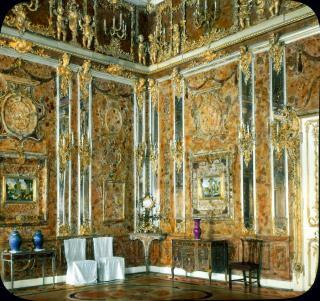 Is it really Russia's lost 'Amber Room'? (Newser) – Some consider it "the world's most valuable piece of lost art," says Reuters, and according to a Polish historian, the Russian treasure may have been located. Bartlomiej Plebanczyk on Friday told his country's TVN24 he's "almost certain" the Amber Room, a chamber made of gold leaf and amber panels, lies under an old World War II German bunker in northern Poland. Plebanczyk's theory was born out of his use of ground-penetrating radar at the site, he tells the Mirror, which reports the previously unknown room measures only 65 square feet. "We need to drill into the room in the bunker and lower a camcorder there," says Plebanczyk, who feels confident he'll find the Amber Room, which is valued at around $500 million and was stolen by the Nazis from Russia's Catherine Palace in 1941, the AP reports. Why not just look under that big slab and find out. I am sure they could break enough off a corner to get in. I guess if they did that the story would not be told anymore, just a story of a hole with nothing in it. No time for this nonsense...have to hurry up and tune into that show where they are looking for Bigfoot!!!! !